Tune in to #Merky every Friday. 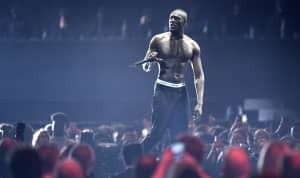 Stormzy recently stopped by Julie Adenuga's Beats 1 radio show to make a special announcement: the grime MC will be hosting his very own program on the platform starting Nov. 20. "I've got bangers, man," he said enthusiastically. "I'm so ready!" Stormzy plans to present a new artist to the world every week; his show will also include a slow jam R&B section. "This ain't just grime, this ain't just rap," he explained. "I'm smooth!" "Why did you decide to call it #Merky?" Adenuga asked. Stormzy replied: "Because it's the #Merky show." Earlier this year, the MC made U.K. chart history. Read the his GEN F profile.